This column contains multiple corrections. This week, the U.S. Senate Committee on Banking, Housing, and Urban Affairs and House Financial Services Committee both hold hearings on topics that involve the Dodd-Frank Wall Street Reform and Consumer Protection Act. 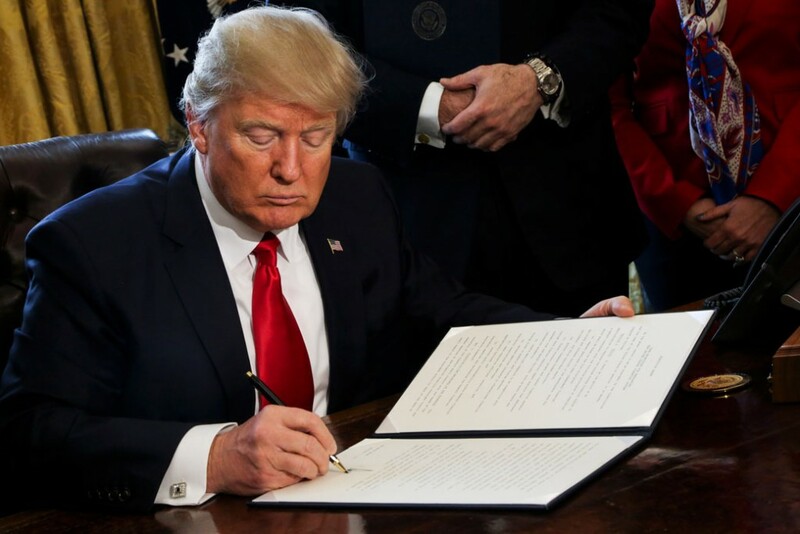 Dodd-Frank, as the act is commonly known, was passed in direct response to clear and unmistakable lessons learned during the 2007-2008 financial crisis. Thanks to Dodd-Frank, today the nation’s financial system is more stable and consumers are better protected from toxic financial products than before the financial crisis. However, in what can only be described as a fit of historical amnesia, some Republican members in Congress want to roll back Dodd-Frank’s vital financial stability and consumer protections. Below, we offer six charts that demonstrate the need for, and positive effect of, financial reform. The 2007-2008 financial crisis, caused by the build-up of consumer abuses and unchecked financial sector risk, precipitated the most severe economic downturn since the Great Depression. Workers lost their jobs, millions of people lost their homes, and families saw their wealth vanish. It is against this backdrop that Dodd-Frank was passed. The act aimed to establish a safer marketplace for consumers and bolster the financial stability of the U.S. economy. 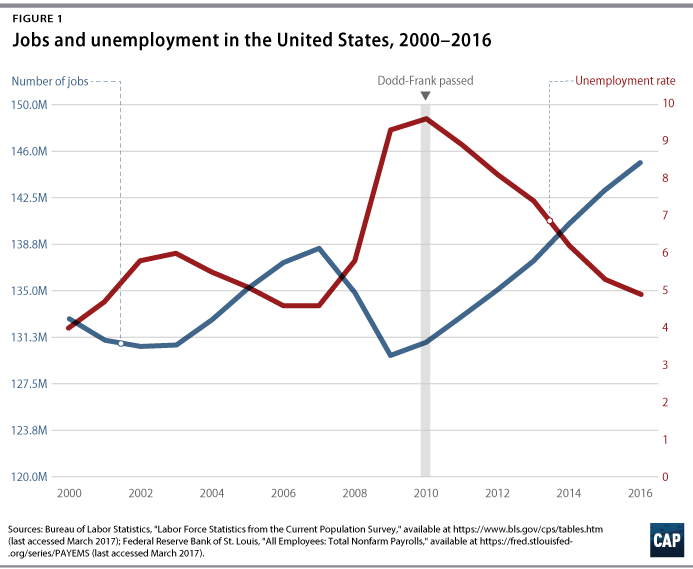 Since the end of the financial crisis, and Dodd-Frank’s passage, the U.S. economy has steadily recovered, although the scars of the Great Recession certainly remain. The Great Recession has had a profound impact on the U.S. economy. Between 2007 and 2009, 8.6 million jobs were lost, resulting in a sharp increase in unemployment rates. In 2010, the average unemployment rate was more than double that reported in 2007: 9.6 percent versus 4.6 percent. The U.S. economy has added millions of jobs since the economy bottomed out in 2009; today, the unemployment rate stands at 4.7 percent. Furthermore, nearly 8 million families have lost their homes since 2007 due to foreclosures. The foreclosure crisis was largely the result of the unscrupulous practices by under-regulated mortgage lenders who sold predatory mortgage products to any investors who would take them in the private label security market. 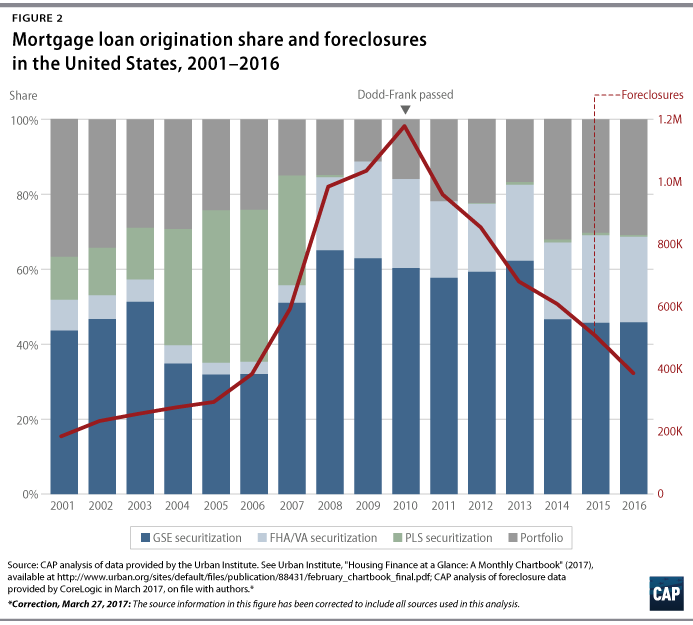 In the meantime, the market share of traditionally safer mortgages, such as those purchased by Fannie Mae and Freddie Mac and those insured by the government, shrunk. This directly refutes the claim that the mortgage crisis was driven by Fannie and Freddie. Home equity represents the main resource for wealth accumulation. Therefore, the losses suffered during the foreclosure crisis are likely to impact American families for generations. Researchers forecast that the typical white family will have 31 percent fewer assets by 2031 than they would were it not for the Great Recession. Typical black families, on the other hand, are likely to experience a 40 percent cut to their total wealth. The financial crisis made clear that consumers were not adequately protected from the dangers of toxic financial products. Dodd-Frank sought to fix this problem by creating the Consumer Financial Protection Bureau, or CFPB, a first-of-its-kind agency designed to protect consumers in the financial marketplace. Since its inception, the bureau has been an unmitigated success. For every $1 of funding, the CFPB has returned approximately $5 to victims of financial wrongdoing; to date, it has returned nearly $12 billion to 29 million wronged Americans. Consumers have also benefited from decreases in high-cost mortgages. Dodd-Frank created standards for safe mortgages and established the CFPB as a new cop on the beat to make sure America’s families aren’t stripped of their wealth again by predatory companies. High-cost mortgages, as a share of total mortgages, have declined significantly since the financial crisis. Financial reform in the credit card market has protected consumers without increasing costs or constraining access. According to the Federal Reserve, total revolving credit—money that consumers can borrow and repay at their discretion, such as credit cards and lines of credit—approached $1 trillion at the end of 2016, showing a return to pre-crisis levels. Meanwhile, the costs of credit have decreased. 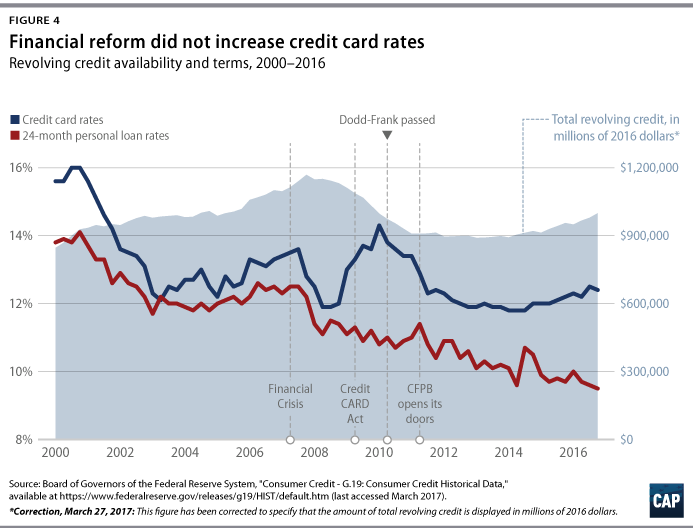 The average interest rate on credit cards was 12.4 percent at the end of 2016—consistent with the rate when the CFPB opened its doors in 2011 and down from 13.3 percent when the Credit CARD Act of 2009 was signed into law to address abusive credit card practices. Personal loan rates, too, fell by more than 1 percentage point over the same period. The CFPB estimates that, between 2011 and 2014, reforms under the CARD Act lowered the total cost to credit—interest and fees combined—by nearly 2 percentage points for borrowers, resulting in credit card holders saving $16 billion. Dodd-Frank also increased capital requirements and other banking standards to protect the financial stability of the U.S. economy. In the lead-up to the financial crisis, the financial sector was highly leveraged and undercapitalized. This meant that, when losses piled up in the sector, banks did not have sufficient equity capital to bear those losses and either experienced devastating bankruptcies or were bailed out by the government. While advocates of Wall Street deregulation argue that lending has been negatively impacted by these vital financial stability enhancements, the data prove otherwise. Dodd-Frank increased banks’ loss-absorbing cushions of equity capital and added other regulatory enhancements, such as strengthened liquidity rules and stress tests. Advocates for lower capital requirements argue that increased capital leads to less lending. Several different studies show this is not the case—better capitalized banks lend more over an economic cycle. 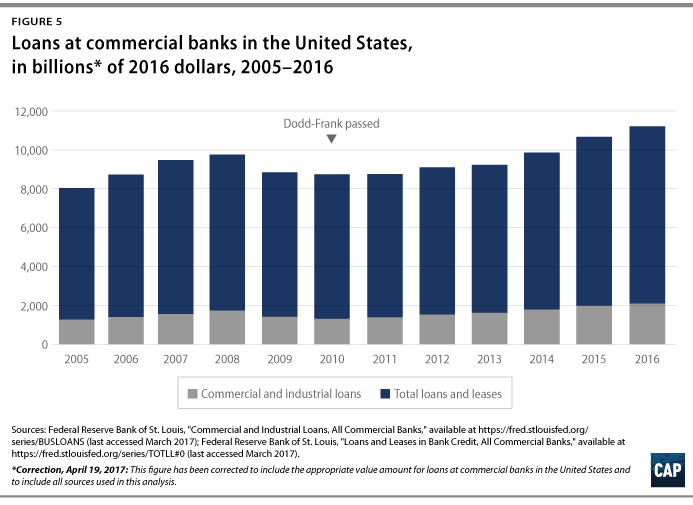 It shouldn’t be a surprise then that Dodd-Frank did not hurt lending; look at Figure 5—banks have significantly increased overall lending and business lending since the bill’s passage. Credit card loans, auto loans, and mortgage lending have all also increased since Dodd-Frank’s passage. Community banks are a key piece to a vibrant and healthy economy. They provide lending to small, local businesses and have built strong relationships with their hometown customers. The claim that community banks are suffering under the burdens of Dodd-Frank has been a familiar refrain trumpeted by many as a reason to roll back financial reform. But since the end of the financial crisis and the passage of Dodd-Frank, community banks have increased their lending and profitability. In the past 12 months, community bank loan balances grew more (9.4 percent) than loan balances at noncommunity banks (6.5 percent). Furthermore, an FDIC study found that the core return on assets for community banks has remained stable since 1985; net income for community banks in the third quarter of 2016 was up 12.9 percent from the third quarter of 2015. 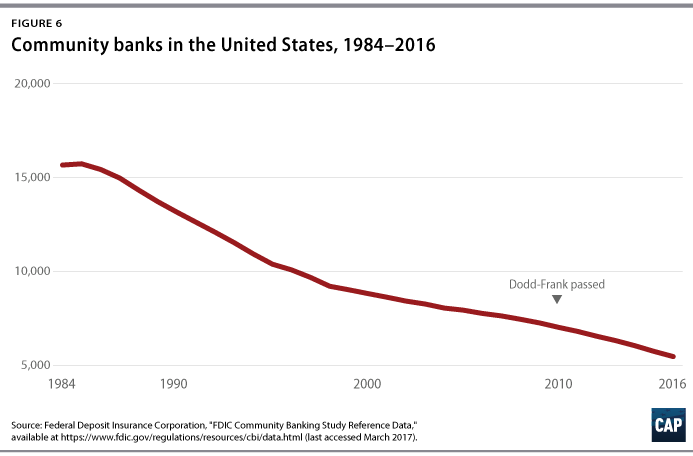 Over time, the number of community banks has certainly declined, but as Figure 6 demonstrates, that trend started well before the passage of Dodd-Frank. Some of the reasons for this trend that started in the 1980s include basic economies of scale that drive consolidation, the increased role of technology in finance, and population and economic decline in some geographies where community banks operate. While regulatory tweaks already in motion may be appropriate for community banks, significant alterations to financial reform are not merited. Dodd-Frank ensures that today’s consumers in the financial marketplace are safer and more financially stable than before the crisis. 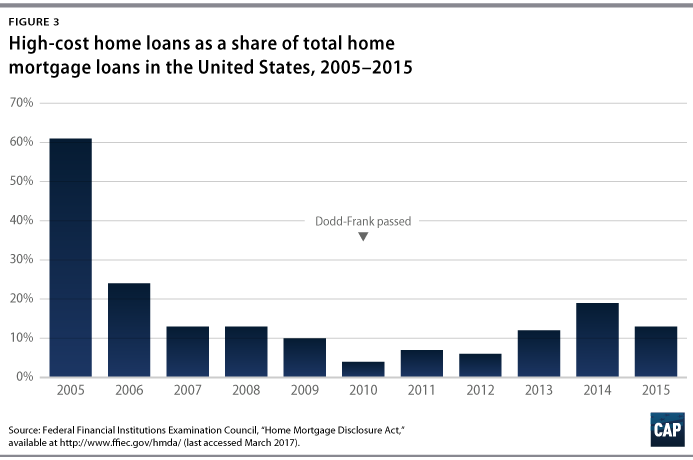 The data clearly show that charges that Dodd-Frank has dampened lending or crushed community banks are untruths used to peddle a deregulatory agenda that will benefit Wall Street megabanks. Gregg Gelzinis is a Special Assistant for the Economic Policy team at American Progress. Michela Zonta is a Senior Policy Analyst for the Housing and Consumer Finance Policy team at American Progress. Joe Valenti is the Director of Consumer Finance at American Progress. Sarah Edelman is the Director of Housing Policy at American Progress.